If you’re visiting Northern Thailand, particularly the Chiang Mai region, you’ll hear the phrase “hill tribes” thrown around a lot, especially by travel agents trying to sell tours. It’s not always clear exactly what "hill tribe" (Chao Khao in Thai) means. The term came about in the 1960s and collectively refers to the groups of ethnic minorities living in Northern Thailand. Scores of hiking/trekking companies and travel agencies offer hill tribe tours where foreigners hike to or are driven into the surrounding mountains to visit these people in outlying villages. During the visits, tourists are often charged an entry fee and asked to buy handicrafts made by these minorities. 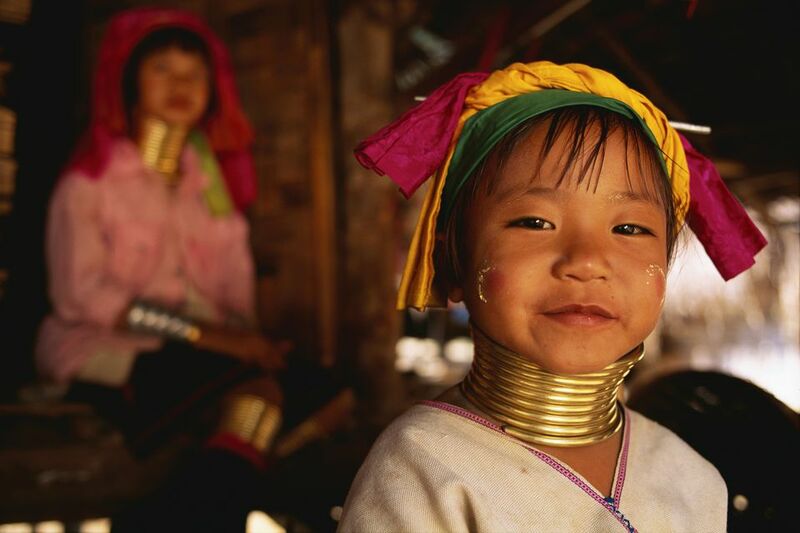 Because of their colorful, traditional dress and dramatically elongated necks adorned with brass rings, the Paduang subgroup of the Karen people from Myanmar/Burma have long been considered a tourist attraction in Thailand. Many of the hill tribe people crossed over into Thailand from Myanmar/Burma and Laos. The Karen hill tribe, made up of many subgroups, is assumed to be the largest; they number in the millions. Although some festivals are shared between different hill tribes, each have their own unique language, customs, and culture. The biggest tourist attraction among the hill tribes tends to be the long-neck Paduang (Kayan Lahwi) subgroup of the Karen people. Seeing women wearing stacks of metal rings — placed there since birth — on their necks is quite shocking and fascinating. The rings distort and elongate their necks. Unfortunately, it’s nearly impossible to find a tour that allows you to visit “authentic” Paduang (long neck) people (i.e., Paduang women who aren’t just wearing the rings because they’ve been compelled to or because they know they’ll be able to make money from tourists by doing so. Even if visiting independently, you'll be charged a relatively steep entrance fee to enter a "long neck" village in Northern Thailand. Very little of this entrance fee seems to get put back into the village. Don't expect a cultural, National Geographic moment: the part of the village tourists can access is essentially one big market with the residents peddling handicrafts and photo opportunities. If you’re looking for the most ethical choice, it’s probably best to skip any tour that advertises the Paduang hill tribe as part of the package. In recent years, issues have been raised about whether it’s ethical to visit the hill tribe people of Thailand. The concerns arise not just because contact with Westerners is likely to destroy their cultures, but because there has been growing evidence that these people are being exploited by tour operators and others who profit from their popularity among visitors. Not much of the money earned from tourism trickles back into the villages. Some have described hill tribe treks as visiting “human zoos,” where the subjects are essentially trapped in their villages, compelled to wear traditional garb and paid little money for their time. Obviously, this is one extreme, and there are examples of hill tribe villages that do not fit this description. The plight of these ethnic minorities in Thailand is made more complicated by the fact that many are refugees who do not have Thai citizenship and are thus already marginalized people with limited rights and few options or avenues for redress. All of this doesn’t mean that it’s impossible to visit villages in Northern Thailand in an ethical way. It means that tourists who want to “do the right thing” just need to be a little thoughtful about the type of tour they go on and research the tour operators leading the hill tribe visit. In general, the best tours are the ones where you go in small groups and stay in villages themselves. These homestays are almost always very "rough" by Western standards — the housing and toilet facilities are very basic; sleeping quarters are often just a sleeping bag on the floor of a shared room. For travelers interested in other cultures and looking for an opportunity to meaningfully interact with people, these tours can end up being very rewarding. It's an old dilemma for travelers and still the subject of much debate: visit hill tribes because the people in villages directly rely on tourism, or don't visit to avoid furthering their exploitation. Because many members of the hill tribes haven't been granted citizenship, their options for earning a living are generally slim: agriculture (often the slash-and-burn style) or tourism.